Northfield, NJ- Helping a child cope with and grieve the death of a family member is a difficult and delicate process. The Alcove Center for Grieving Children and Families, located in Northfield, New Jersey, provides a safe place where children and their families can receive comfort and support through a healing process. 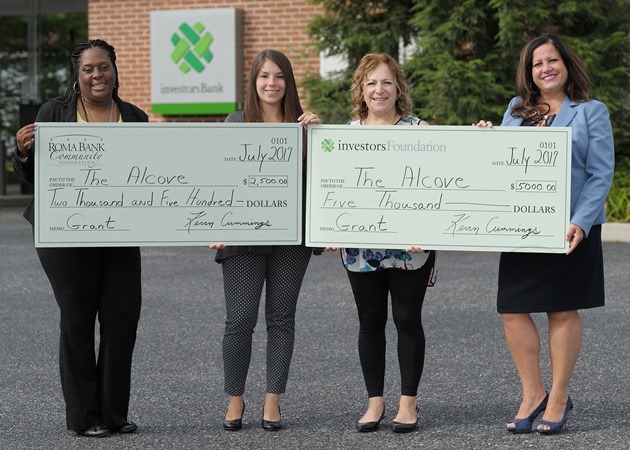 Thanks in part to $7,500 in grants from the Investors Foundation and Roma Bank Community Foundation, the Alcove will be able to expand its services from Atlantic and Cape May Counties into Gloucester County. The Alcove applied for the grants from the Investors Foundation and Roma Bank Community Foundation, which support non-profit organizations that enrich the diverse communities served by Investors Bank. Roma Bank became part of Investors Bank in December 2013. The Alcove offers peer support groups for children aged 3 to 18. The groups are age-specific and are for ages 3 to 6, 7 to 10, 11 to 14, and 15 to 18. There also are adult groups available for those 19 and over, and for surviving parents, grandparents, or guardians. Shemtov said the children’s activities are designed to help them discuss death through play, art, storytelling, music, and discussion. The groups, which are held every other week, run for one hour and are facilitated by volunteers who have completed 30 hours of intensive training. Shemtov said that families can attend for as long as they need.